As with so many music and book publishing projects in these challenging economic times Paul Stewart's small LA based publishing company Over The Edge Books is turning to Kickstarter to help launch the excellent hip-hop photo book West Coast Hip Hop: A History in Pictures by veteran music photographer Michael Miller. The photo-journalist, who was in LA as well as other West Coast spots, during hip-hop's golden era and beyond, has compiled an impressive collection that offers an invaluable view of the key West Coast hip-hop artists of the era including Ice Cube, NWA, Too $hort, Cypress Hill, 2Pac, Snoop Doggy Dogg, House Of Pain, Souls of Mischief, Coolio - most of which were shot for album covers and have gone on to become iconic symbols of that historic era in hip-hop music. The publication of the limited edition book, which has already surpassed its Kickstarter goals, will coincide with many of the book's photos been exhibited in galleries in both California and New York City. This week I caught up with publisher Paul Stewart, who has a long rich music history, and photojournalist Michael Miller, who has also worked with non hip-hop artists, to ask them each about the book and the hip-hop history presents. Done out of pure reverence for the great late Miles Davis, musician Andy Baio recorded an inspired 8-Bit reinterpretation of Davis' jazz classic Kind of Blue, in recent months. Aptly titled Kind Of Bloop, journalist/musician Baio writes of the inspired composition on his blog, "I've always wondered what chiptune jazz covers would sound like. What would the jazz masters sound like on a Nintendo Entertainment System? Coltrane on a C-64? Mingus on Amiga?" 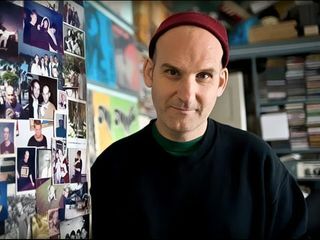 Baio says that in his extensive research of such jazz classic 8-Bit covers he was only able to find four jazz covers ever released: ast0r's version of Coltrane's Giant Steps and Charlie Parker's Confirmation, Sergeeo's own Giant Steps cover, and Bun's version of Coltrane's My Favorite Things. Portland, OR based Baio, who describes himself as a journalist/programmer and the CTO of Kickstarter, then invited the aforementioned Ast0r and Sergeeo, along with the chiptune artists Virt, Shnabubula, and Disasterpeace, to collaborate with him on a track-by-track remake of the classic Miles Davis album. The Amoeblog recently caught up with Baio to ask him about the project and the crowdfunding platform Kickstarter. Amoeblog: How did you first get the idea to reinterpret Kind of Blue?